SO, HOW DID YOU SPEND YOUR WEEKEND? My weekend was an amazing, incredibly exhausting, exhilarating adventure filled with food, music, beer, Route 66, road trips on Route 66, vintage vehicles, and good times with friends. It was the annual Route 66 Fun Run – a 180 mile block party on America’s most famous highway with Kingman, Arizona in the very middle of it all. The adventure kicked off early on Saturday morning with my son, his friend that is a sort of second son, Louie, from Las Vegas, and breakfast at Rutherford’s on Andy Devine Avenue (Route 66). Then we joined the herd of vintage vehicles, Corvette’s, colorful street rods, rat rods, motorcycles, and wheeled oddities that transformed two lanes of blacktop stretching across the Hualapai Valley into a living time capsule. They were on the way to Seligman. Our destination was Truxton and Frontier Restaurant and Motel. To lend a bit of promotional support for Stacey and Allen, the new proprietors of the historic property, I had offered to meet with visitors, sign books, and answer Route 66 questions until noon. It was a grand morning; near perfect temperatures, an endless parade of rolling automotive history, friends, and an atmosphere charged with a palpable sense of excitement. Allen was kept busy on the grill (great hamburgers), Stacey met with visitors, and I provided an impromptu tour of Truxton based on memories of chicken fried steaks at the Cattleman’s Cafe, a bowl of chili at the Frontier Restaurant, and waiting out a snow storm in room three of the motel. I also gathered a few photos for a book being developed by Joe Sonderman and visited with friends as they stopped by. Reluctantly but with a sense of eager anticipation we headed back into Kingman shortly after noon. A crush of traffic reminiscent of Route 66 circa 1965 prevented a stop at the Hackberry General Store but we did stop to visit with friends and check on progress at Giganticus Headicus. In Kingman we found a parking place north of Beale Street and plunged headlong into a veritable sea of automotive history. We also took a few minutes to check out the House of Hops in the fully refurbished Kingman Club and sample a glass of Amber Scorpion. 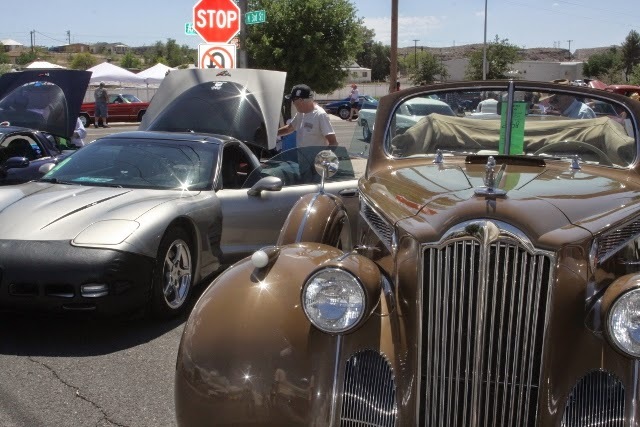 The cars, the ebb and flow of crushing crowds, traffic, and old friends ensure that Saturday afternoon in Kingman during the annual Route 66 Fun is a memorable adventure. As I have a passion for the time capsules that are original automobiles there is something almost magical in seeing a 1936 Packard, 1933 Dodge, 1915 Ford, Corvair truck, 1951 Ford Ute from Australia, or 1966 Plymouth convertible on the road. 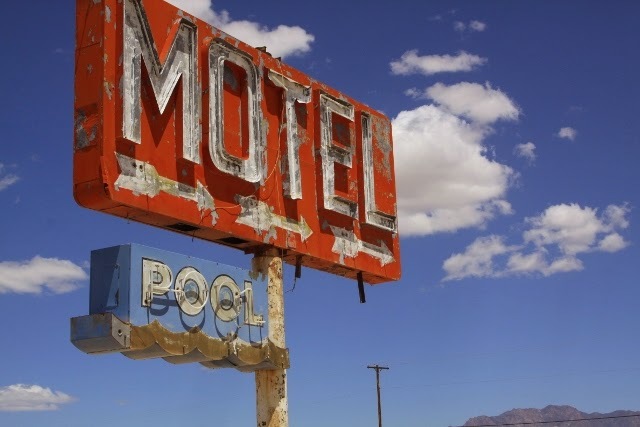 That in itself ensures the annual Route 66 Fun Run is a grand adventure. Add to this the fact that it is something my son and I have been doing since before he was old enough to walk, and it becomes a highlight of the year. We stopped by the Powerhouse to check out the latest additions to the Route 66 Electric Vehicle Museum and to say howdy to Bob Boze Bell who was signing books. The long closed Beale Hotel and Old Trails Garage were open for sneak peaks, and a dust covered GTO hidden from the world for decades was on display. A pressing meeting at 4:00 intruded into the festivities but this too was an exciting new venture. Scott Dunton has initiated a massive initiative to breath new life into the cities historic district and along the Route 66 corridor. 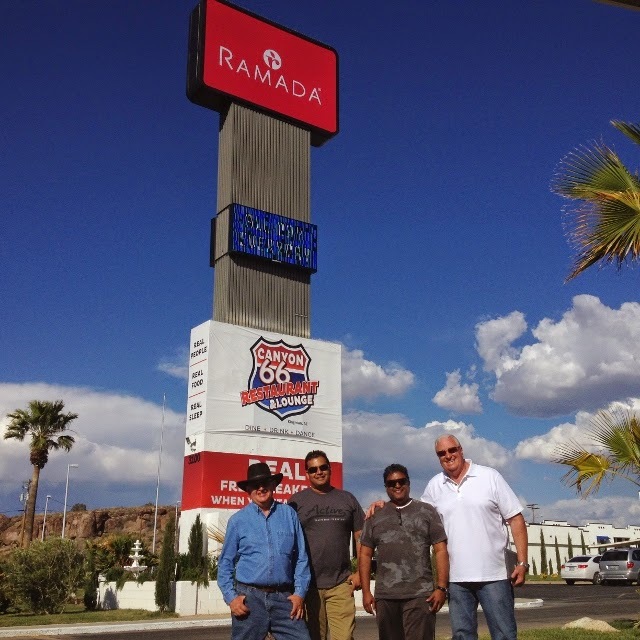 Joining him in the endeavor are Noble and Joel Zubaid who have recently transformed the old Holiday Inn that dates to the 1960’s into the Ramada Inn and Canyon 66 Restaurant and Lounge. 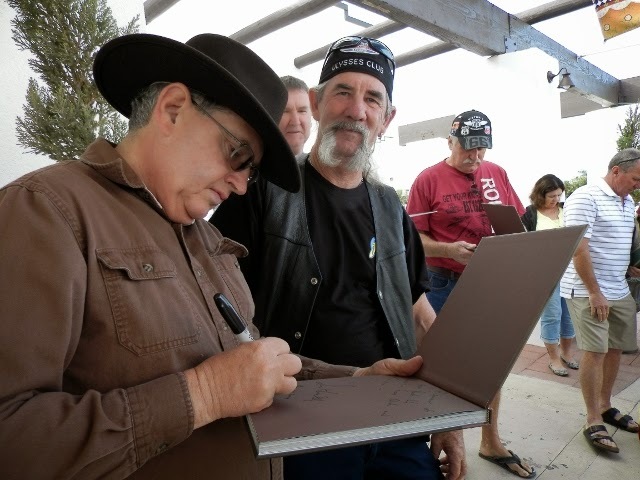 In addition to partnering with the Mohave County Fairgrounds, the brothers have offered to subsidize some of my Kingman area promotional endeavors, the subject of the Saturday afternoon meeting. Needless to say this put a bit of a spring in my step. That exciting meeting was followed by an eagerly anticipated dinner at the Garlic Clove restaurant with Steve Rider, Karen and Sean Evans, George and Bonnie Game of the Canadian Route 66 Association, John Springs, Daniel Azzopardi of Australian based Route 66 Tours, Mike and Sharon Ward, and my dearest friend. The delightful meal and conversation amply seasoned with laughter was followed with a walk along Beale Street and another sampling of the offerings at the House of Hops. 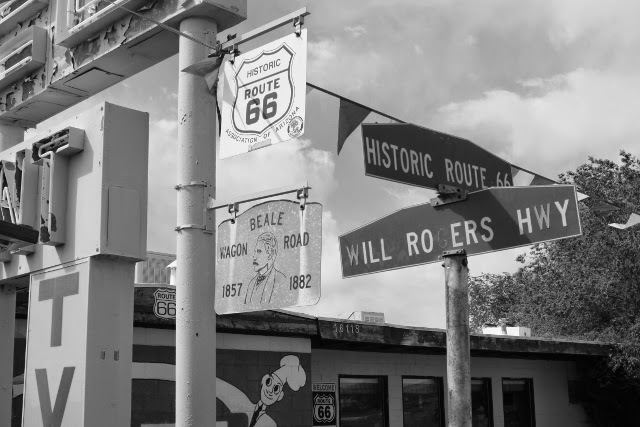 Surprises abound with Route 66 adventures, even if it is simply a stroll though town and stopping for a glass of beer. I walked into the House of Hops and discovered Mark Powell, an acquaintance from England, and his girlfriend, Jackie Kendall. That was a most pleasant surprise as I have not had an opportunity to visit with Mark in quite some time. Adding them to our eclectic group enhanced its international flavor. The next stop was a Route 66 celebration hosted by Sam and Monica Frisher, owners of the historic El Trovatore Motel. Under a full moon that crowned the glowing El Trovatore tower, I granted an interview to Jim Conkle who was filming for a PBS program, signed a few books, and we visited with Gary Cron, Mike May, and an array of acquaintances and friends. The Sunday schedule called for an earlier start. 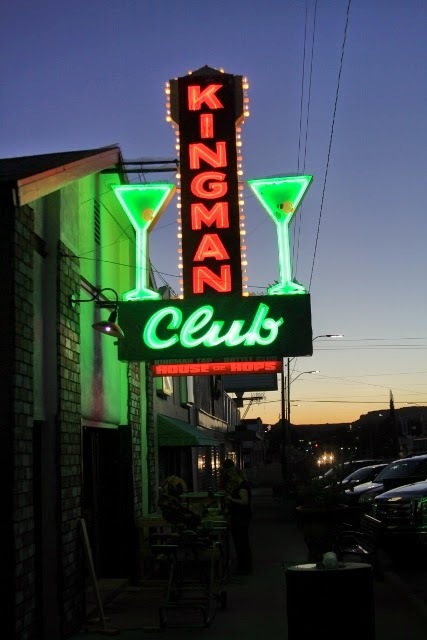 At 6:00 I met with Joel Zubaid to discuss ideas for the promotion and development of the Route 66 corridor in Kingman. At 8:00, I made a presentation, signed books, and answered questions for a group on holiday courtesy of Australian based Route 66 Tours, always a highlight. In turn this was followed with a long overdue tour of Route 66 through Oatman and back on the later alignment through Yucca for Steve Rider, a Route 66 post card collector from New York that has generously contributed materials for several of our Route 66 books. It was a most delightful adventure enhanced by a lunch shared with Mike and Sharon Ward at the Topock Resort on the Colorado River. Needless to say, even though exhaustion was rearing its head last evening, it was a weekend to remember! WHERE HAVE ALL THE CHARACTERS GONE?